Out of all the beers I’ve managed to review on this blog, The Lost Abbey brews are perhaps the most fun to spill some ink over, so to speak. Not only are these brews so pleasurable and oftentimes eventful to drink, but The Lost Abbey’s sometimes apocalyptic and post-modern themes about heaven and hell and challenging boundaries are testimony to a brewery that completely appreciates the value and joy of not just a beer’s taste and aromatics, but the fun one gets from artful packaging that’s both holistic and thematically-connected. In each of the three samples I’ve reviewed here (10 Commandments, Avant Garde, and Judgment day), the bottle’s labels border on the realm of mesmerizing and make for wonderful conversation while sharing its contents. 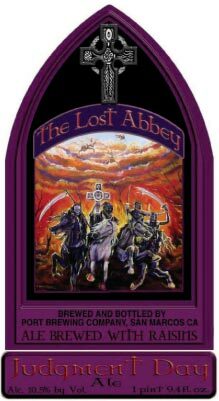 The value added from The Lost Abbey’s packaging is akin to the value added by purchasing a music album, with its easily accessible artwork and text, versus the bland act of simply downloading the album (legally of course). In short, while packaging will never turn a bad beer into a good one, it will make the pleasure of drinking a good beer all the more pleasurable. And this was precisely my experience with The Lost Abbey Judgment Day. 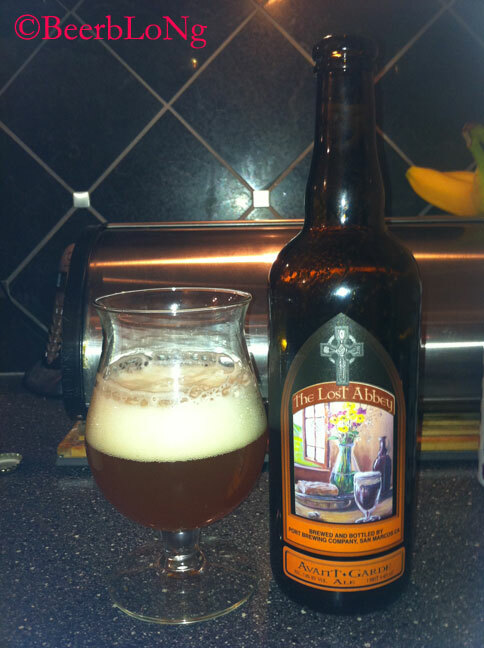 Founded in 2006, The Lost Abbey or Port Brewing is located San Marcos, California – a medium-sized city located about 20 miles (32 km) north of San Diego. The brewery offers about six regular beers, another six seasonal variants, and four of what they refer to as “non-denominational ales” – i.e. ones that don’t comport with any well-established beer style. Hence, not only does The Lost Abbey clearly value a good sense of humor, but their product line appears to reflect a blend of conventionalism and innovation, or perhaps “reformation” (see my 10 Commandments review for a somewhat quirky elaboration on this point). Judgment Day, along with other Lost Abbey brews, are some of the most eye-catching products. The packaging, with a towering, almost gothic-like bottle affixed with a cork and well-designed artwork, really does speak volumes to The Lost Abbey’s sometimes-apocalyptic brewing theme. In the case of Judgment Day, the theme is the coming of the apocalypse, where according to the Lost Abbey’s website presentation for JudgmentDay, “the sunny blue pastoral skies turn sickly black revealing the imminent demise of every soul caught between heaven and hell”. Then come the Four Horsemen of the Apocalypse, who are depicted on the bottle’s purple and black label and collectively symbolize conquest, war, famine, and death. Indeed, God’s eternal judgment has arrived, and The Lost Abbey’s page wraps up with the appropriate sales pitch: “Challenge yourself to embrace passion, persistence and a motivated way of life. So that when Judgment Day arrives from nowhere, you’ll go out knowing full well that you’ve lived your life on your terms and they can’t take that away from you”. Without a doubt, The Lost Abbey products I’ve sampled are tributes to “passion, persistence and a motivated way of life”, and Judgment Day is no different. Brewed with raisins, this 10.5 percent ABV abbey quad is a fine representation of this style and, in some ways, it’s in a class of its own. Grabbing the bottle and forcefully pulling off the cork immediately releases a brief hiss and then a pop, just as any beer in this price range should do. When pouring Judgment Day into a glass, the translucent, super dark brown body and well-retained, two-finger beige head yields a fair lacing matrix. Aroma? Well, Judgment Day is anything but apocalyptic! The smell of raisins is definitely forward, as is the sweet malts and a distinct candy-like note, all or which blend well with the barely noticeable alcohol tone. Faint woody and perhaps vanilla notes are also present. Overall, the nose is seriously powerful, complex, and predicts a very sweet brew. The mouthfeel is pleasant, with a somewhat syrupy feel and a moderate amount of carbonation. Judgment Day’s flavor is remarkably similar to the aroma. Again, raisins and malts clearly dominate, and if you close your eyes, it almost feels like drinking some sort of syrupy raisin juice (although I must admit to never trying that). This beast is all sweetness, and perhaps a just a tad too candy sweet for my palate. But, while the alcohol note is surprisingly well restrained (especially when compared to the roughness of The Lost Abbey’s 10 Commandments), the alcohol’s warming sensation plays out nicely with the sweetness. And, while the hop references gain just a bit of prominence in the finish, I suspect that a hoppier finish may have helped to balance out that sweetness. All in all, The Lost Abbey Judgment Day is an amazingly sweet and complex beer, and pairing raisins with this particular beer style is well thought through. And, if the Four Horsemen were to descend on all of us today, I would indeed be happy to have Judgment Day around as one of my final beers before God’s eternal judgment. Setting expectations is always risky, especially when applying them to beer. On the one hand, spending time anticipating a beer’s quality is part of the joy behind letting the beer cellar for a few months and routinely peeking at the bottle as it sits patiently maturing. On the other hand, expectations can really be a letdown when the beer fails to live up to the hype. 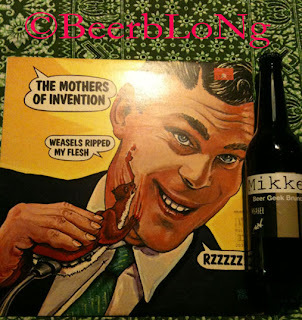 Fortunately for me, and for my close friend and partner in beer, Mikkeller’s Beer Geek Brunch Weasel not only lived up to our expectations, but actually shattered them by being nearly everything expected and more. Indeed, we did everything humanly possible to raise our expectations and savor the process of anticipation. Upon purchasing Beer Geek Brunch back in early October, I immediately placed it in the cellar and would occasionally take a peek at it as the bottle sat on the self. I read and watched some reviews of it, showed the bottle off to some of my neighbors while talking a bit about how it was brewed, and then finally set a date to share it with my friend. 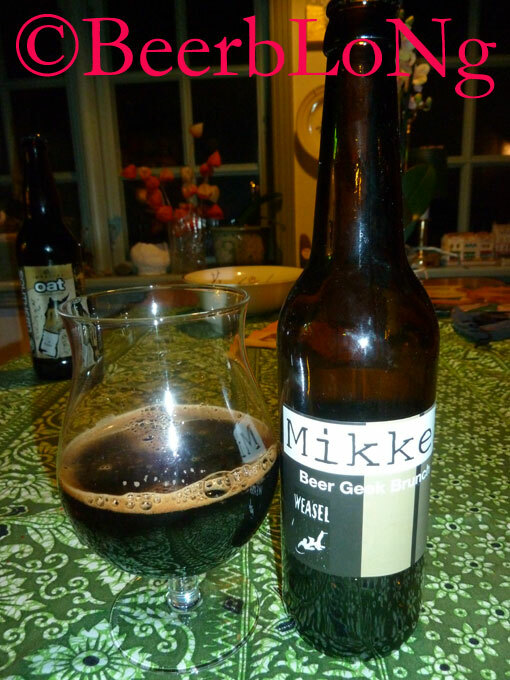 For his part, he spent some quality time sipping away on Mikkeller’s other notable stout, namely the Beer Geek Breakfast, and admiring it’s powerful coffee profile. All in all, the stakes were considerably high when the Weasel climax – or what might have otherwise been an anti-climax of epic proportions – unfolded in the night of the actual session. As an added bonus, my friend coincidentally had a vinyl release of Weasels Ripped my Flesh by The Mothers of Invention, and we thought this was an appropriate music selection for our Beer Geek Brunch Weasel experience. And so the session begins. While Mikkeller officially hails from Copenhagen, Mikkel Borg Bjergsø, Mikkeller’s brewmaster, manager, and the ‘mother of invention’ behind Beer Geek Brunch, brews beer in a variety of locations throughout Europe and the United States. Mikkeller’s Beer Geek Brunch, along with the Beer Geek Breakfast, is brewed at Nøgne Ø, which lies in Grimstad – a small rural community along the southern coast of Norway. Both Mikkeller and Nøgne Ø brew some of the finest products in Scandinavia, and I cannot think of more logical collaboration of sorts or a collaboration where expectations are a relatively safe bet to place. Mikkeller’s Beer Geek Brunch Weasel feels quite a bit like Mikkeller’s Beer Geek Breakfast. Indeed, both are oatmeal stouts, and both are brewed with gourmet coffee. However, the former rounds out with a whopping 10.9 percent ABV while the latter stands at a 7.5 percent ABV. More interesting still, Beer Geek Brunch has a more robust coffee and dark chocolate synthesis, and based on the title of my previous Beer Geek Breakfast post, that says a lot about the amazing quality of Beer Geek Brunch. Without a doubt, part of this robustness is connected to the feature ingredient used in Beer Geek Brunch – namely the Vietnamese cà phê chồn, or what English speakers refer to as weasel coffee. So, what’s this cà phê chồn all about? Well, for starters, the term cà phê chồn does implicate coffee, but it does not really have much to do with weasels. Instead, the animal in question is the civet, or the asian palm civet to be exact, which is a member of the Viverridae family rather than the weasel’s Mustelidae family. Perhaps the more well-known English term for the civet is toddycat (see Wikipedia). What makes the civet so important for coffee and for beer is its diet and what is done with the byproducts of that diet. For starters, civets eat a variety of berries, including coffee berries, and the animal selects only the finest and most mature coffee beans and then excretes them a day or so later. Afterwards, workers gather the partially digested coffee beans from the civet’s dropping (See About.com). The beans are then thoroughly washed, sun dried, and lightly roasted (See Wikipedia), and are ultimately used to brew some of the world’s most expensive coffees and to brew this fine Mikkeller oatmeal stout. Yes, when drinking Beer Geek Brunch, you are also consuming the remnants of partially digested coffee beans! Yummy, right? Well, yes it is in fact. 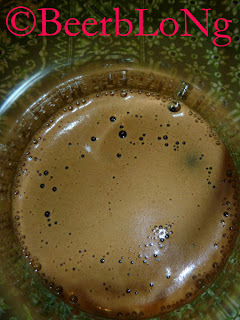 The resulting product from “civet coffee beans” is sometimes referred to as civet coffee, or kopi luwak in Indonesia. In Vietnam, which is where Mikkeller’s civet beans originate, civet coffee is sometimes referred to as fox-dung coffee, where the alteration in the bean’s protein structure brought on by the digestive process is hypothesized as the reason for why the resulting coffee is richer, full-bodied, and somewhat syrupy (See Wikipedia). To be sure, this richness is plainly evident in Mikkeller’s Beer Geek Brunch. Now back to our session. Popping the cap and pouring it into a glass reveals the unmistakable stout signatures: The body appears with a super dark brown color and a dense, medium-sized brown head that settles comfortably into a thin brown foam. As an added aesthetics, a faint burgundy color appears at the point where the beer kisses the side of the glass. While still tight and sticky, the lacing of Beer Geek Brunch is a bit more timid than what is found in the Beer Geek Breakfast, although that can be expected with a higher ABV brew. In terms of the nose, Beer Geek Brunch is perhaps the most aromatic stout we’ve ever come across: In a word, it was so amazingly climatic not because of its complexity per se, but in the way the aromas blended together in a powerful and seamless presentation. The show kicks off with a generous blast of bitter, dark chocolate and then seamlessly transitions into a powerful roasted coffee nose. At the same time, semi-sweet malts and light licorice tones dance around in the background. After about three seconds of an uninterrupted sniff, the aromas come together in what really struck me as a sort of smoked, blackstrap molasses. What was perhaps the most amazing was the almost perfect match between the nose and the taste. Taking a generous mouthful comes with a mild amount of carbonation, a creamy mouthfeel, and an instant explosion of dark chocolate, with a rapid transition to roasted coffee and a smoked-like blackstrap molasses synthesis in the finish. At the same time, a faint licorice reference appears, disappears, and then reappears throughout the show. Aside from a warming sensation during the finish, when Beer Geek Brunch is served at its proper temperature, an edgy and somewhat distracting alcohol tone is virtually absent. While a few other stouts out there may have a wider spectrum of flavors, Beer Geek Brunch presents the flavors in a way that, in our view, is simply unrivaled. And for me personally, presentation is an important part of the beer experience. Without a doubt, placing and raising our expectations on Mikkeller’s Beer Geek Brunch paid enormous dividends. When considering the time we spent anticipating its aromas and flavors, and then having those expectations exceeded by leaps and bounds, Beer Geek Brunch has perhaps been one of the most enjoyable beer experiences we’ve ever come across. In our view, this is a nearly flawless brew, and one that is surely a risk worth taking. Avant Garde is what The Lost Abbey refers to as a “farmhouse-styled ale”, although their website, like their apparent brewing philosophy generally, shuns the notion of classifying this brew. In their words, “some might want to label this as a beer brewed in the Bière de Garde tradition of Northern France. We would prefer to say it was brewed in the Avant Garde [italics my own] style of beers that will reward all those who seek the not so ordinary”. These are fine words, but does their brew really live up to this aspiration? Well, for starters, modernists like me just love our classification schemas, and indeed to a fault in some respects. So, be it Bière de Garde or avant-garde, things become clearer – or so it seems – when the world around us comports with the known. And the folks over at Ratebeer and BeerAdvocate both describe Avant Garde as exemplar of the well-known Bière de Garde tradition. From Northern France historically, these “farmhouse ales” are generally top-fermented, and to avoid the sometimes-funky behavior of yeast in the warmer summer-month temperatures, this style was traditionally brewed in farmhouses during the cooler winter and spring months (see Wikipedia). Still, farmhouse ales are intended for consumption during the summer and autumn, and hence any respectable Bière de Garde should be a refreshing summertime treat (see bieredegarde.com). And Lost Abbey’s Avant Garde is certainly one of those treats. Grabbing the bottle and forcefully pulling off the cork immediately releases a brief hiss and then a pop, just as any beer in this price range should do. When pouring the Avant Garde into a glass, the hazy, medium-amber body and two-finger white head are signs of what’s to come: an enticingly sweet beverage with lots to offer its drinker. Swirling the glass a bit reveals a decent amount of lacing, but perhaps a tad less than what I expected. Aroma? Well, Avant Garde is not all that powerful, but spending some time nurturing it in the glass indeed pays dividends: Think fresh sweet bread, a bit of grains and grass, and a sort of well-aged feel. Fruity notes, or berries perhaps, are also discernable, as is a slight nutty tone. However, the caramel note was not as forthcoming as expected. The mouthfeel is simply outstanding, where the full and effervescent body, along with the multiplicity of subtle flavors, coalesces into an absolutely refreshing, but eventful beer. When compared to the aroma, Avant Garde’s flavor is far more fruity and reminiscent of thoroughly ripe yellow apples and berries. A bready flavor lurks in the background and is much more timid when compared to its pointed presentation in the nose. Hop references are virtually absent, just as it should be for this particular style of beer. And while the spicy note is subtle, it becomes a bit more focuses toward the dry and largely sweet finish. The Lost Abbey would probably like us to avoid reviewing Avant Garde up against a well-known traditional beer style – namely Bière de Garde, and instead review it as a style of its own or up against its supposed avant-garde nature. Either way, we’re dealing with classes, and aside from the focused spicy note in the finish, Avant Garde does not clearly cross the boundaries into the avant-garde per se and is instead an excellent representation of the Bière de Garde tradition. And there is absolutely nothing wrong with that.